Would love to see a map with two villages with native huts on one side and military quansit huts on the other side of a mid size island. 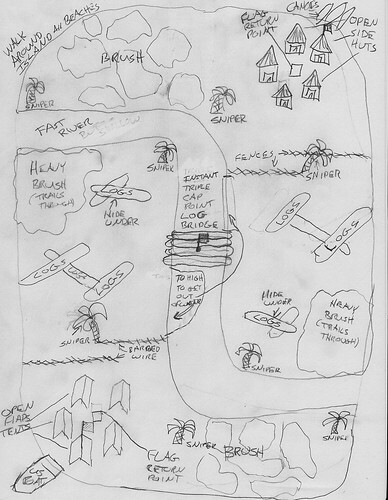 Lots of undergrowth, palm trees with sniper locations in them. Obvious trails, but also able to go through undergrowth but with slowdown obstacles. Flag capping like Christmas town (I think) where you have to get to their flag and return it to your own base. But also a twist, there is a center flag that also must be triple capped (fast cap) before the returned flag counts. Your own flag doesn't have to be at the base though, just the capped one. So, who's up for making this happen? I might consider doing this if I didn't already have about 4 maps waiting in line to be finished. Do we have any other mappers with the skillz to make this map? I think it could be a winner. I just don't have the ability or time to learn the ability. Im not the greatest map designer out there, but I'm learning and I'm pretty decent with hammer, I might give this a go. I'm currently working on a project of my own right now, but I'll let you know if I decide to. If I do, I'll PM you for more details. Alright, I think I fixed my PM issue lol, but anyway, when you get a chance, post here with some more details about what you would like the map to be. I'll start with the basic design and such, and not worry too much about what the caps are, I'll worry about those after the map is laid out. But explain where you would like the caps to be, and what not, and more detail about the huts or sides and such. Here's what I'm thinking - it should be equal distances on both sides although it doesn't quite look like it. Alright, I think I have the main idea. Are the spots where it says "heavy brush" completely full of brush, or just those circles? Heavy brush throughout. Just wanted to make sure that the trails was obvious. I'm assuming the brush covers everything, even around the logs, just with trails between them? Exactly - trails for the easy route, but brush everywhere else. Yep, they could go all around the island, but only so far out. Sounds like we're on the same page! Also, my personal thoughts, I'm not sure about what size you were thinking for the map, but personally, I was thinking it should be a medium-sized map (that's hard to judge ). But with how many routes there are, including brush with slowdowns and the beach and what not, if it is too big, no one will want to play it because it will be too easy for someone to sneak by with fewer players, but this is more of a map for a fuller server anyway. But I'm just letting you know.